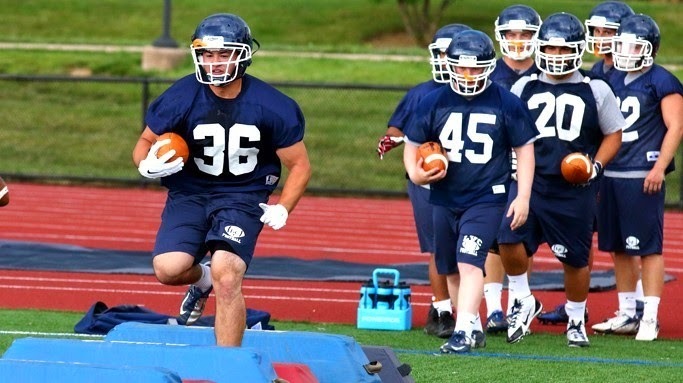 ANNVILLE, Pa. - Lebanon Valley College football opened preseason camp on Thursday, getting their first on-field workout in a day after reporting to campus. The defending Middle Atlantic Conference champions, who start the season Sept. 6 at Franklin & Marshall, held their first practice after a day of testing that included the bench press, vertical and broad jumps, and 40-yard dash. LVC opened camp with 105 student-athletes on the roster. Lebanon Valley's men's soccer, women's soccer, field hockey, and volleyball teams report Friday, with men's and women's cross country coming in Sunday for preseason training. Both soccer teams and volleyball open the 2014 LVC season officially on Aug. 29 with contests on the road. For more camp reports, check back with GoDutchmen.com in August and follow @lvcathletics on Twitter and Instagram. Your positive comments and suggestions are welcome. This site is not here for trolling or negative comments from one team fan to another. Fans pick the best quarterback in the Middle Atlantic Conference "Unscientifically"
Copyright 2018 by Williamsport OnLine - except for incoming feeds.. Awesome Inc. theme. Powered by Blogger.